When India’s ‘Act East Policy’ meets South Korea’s ‘New Southern Policy’ in the Indo-Pacific. South Korean President Moon Jae-in visited India from July 8 to 11, his first visit to India since being elected last year. During his visit, Moon had bilateral discussions with Indian Prime Minister Narendra Modi and he also attended a total of 18 events during his four-day long tour of India. Of those 18 events, Modi accompanied Moon to 11 events, which reflects how much importance the host nation accorded to the visiting dignitary. Modi even joined Moon in his visit to the Gandhi Memorial Museum in New Delhi — the first time that an Indian prime minister accompanied any visiting foreign dignitary to the place. Both the leaders also participated in the completion ceremony of Samsung Electronics’ mobile phone factory in Noida. A total of 11 agreements were signed during Moon’s visit, involving trade, culture, biotechnology, ICT and telecommunications, and scientific and technological cooperation. At a time when major powers along with middle powers in the Indo-Pacific region are pursuing the “Free and Open Indo-Pacific” policy, Moon had enunciated his “New Southern Policy” last year to further strengthen bilateral relations with countries in South and Southeast Asia in general and India in particular. The New Southern Policy was rolled out against the backdrop of South Korea’s diplomatic row with China over deployment of the U.S. Terminal High Altitude Area Defence (THAAD) anti-missile system in South Korea, which led to retaliatory measures from Beijing. Moon’s New Southern Policy aims to strengthen the economic-cooperation and build a prosperous and people-centric community of peace while India’s “Act East Policy,” as articulated by Modi, focuses on promoting deeper economic engagement, reinvigorating cultural and civilizational relations, and developing new strategic partnerships with countries in the Indo-Pacific region through continuous engagement at bilateral as well as at multilateral levels. Both these policies show convergence in their objectives and should further strengthen the Special Strategic Partnership between India and South Korea. 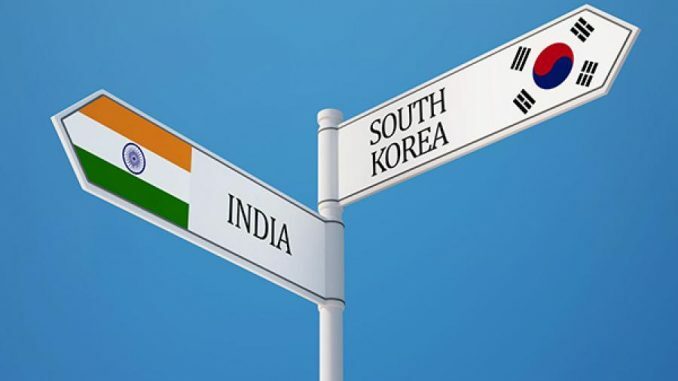 In recent years, relations between New Delhi and Seoul have made great progress and become multidimensional, stimulated by a substantial convergence of strategic interests and high-level government exchanges. The India-South Korea axis can be very valuable at a time when the world is passing through a phase of uncertainty; this vital bilateral partnership can significantly contribute to peace, security, and stability in the Indo-Pacific region, especially through strengthened economic partnership and deepen security relations. South Korea’s open market policies finds a clear resonance with India’s economic liberalization, and the Act East Policy certainly complements the New Southern Policy and adds new substance and impetus to bilateral cooperation between two nations in all areas of engagement. A lot of complementarities exists at various levels between two countries; for example, South Korea’s technological advancement and manufacturing capabilities can be helpful in India’s economic growth and human resource development. Seoul’s successful development story of the last few decades can complement Modi’s vision of making a “New India” by 2022. India and South Korea have also deepened their bilateral relations in the defense sector through more military exercises and training as part of efforts to enlarge their partnership beyond economic engagement. The two countries hold a joint anti-piracy, search and rescue exercise, Sahyog-Hyeoblyeog, which is conducted between the Indian Coast Guard (ICG) and Korean Coast Guard (KCG) to improve maritime security and interoperability in the Indian Ocean Region. Besides holding more joint exercises, New Delhi is also looking to attract South Korean defense companies to invest in India. On the economic front, relations have room for further growth. India’s total exports to South Korea stands at $4.95 billion which is just 1.03 percent of South Korea’s total imports. India’s imports from South Korea are $15.1 billion, 3.3 percent of India’s total imports. The South Korean economy is largely based on an export-led model and is heavily dependent on the United States, China, and Japan as its export markets. But a combination of China’s economic sanctions imposed last year on South Korea in the wake of THAAD deployment, the ongoing U.S.-China trade war, and almost complete exhaustion of these markets has forced Seoul to diversify its options. Thus Moon’s New Southern Policy is a clear push to find new partners and new markets so as to decrease Seoul’s overdependence on China and the United States. In this context, there are boundless opportunities for businesses from India and South Korea to take advantage of the unexplored potential for economic partnership at a time when protectionism is growing around the world. There are approximately 500 South Korean companies operating in India, which includes companies like Samsung, LG, and Hyundai. These firms have become familiar names, especially in the middle-class households of India, while making a remarkable contribution to India’s economic growth. South Korean companies are already involved in many of Modi’s flagship initiatives, which includes Make in India, Skill India, Digital India, Start-up India, Building Industrial Corridors, and Smart Cities. In particular, the Indian government’s plan to build 100 smart cities and construct industrial corridors to link the major cities is an important area where South Korean companies can participate in infrastructural projects that will be mutually beneficial for both nations. There are vast business opportunities for both countries to expand cooperation in other unexplored areas such as shipbuilding, the aerospace industry, manufacturing of medical devices, and food processing. Seoul’s high-end technology can be effectively coupled with the high-skilled workforce of India. The deeper economic partnership between New Delhi and Seoul can also be understood from the newly inaugurated Samsung Electronics cellphone manufacturing unit in Noida, Uttar Pradesh. Built at a cost of 49.15 billion rupees ($720 million) under the Make in India initiative, the factory can produce 120 million smartphones every year and will also create thousands of new jobs in India. In addition, South Korea’s Kia Motors is in the process of setting up an automobile manufacturing plant in the Yerramanchi village of Anantapur district in Andhra Pradesh. It is expected that from March 2019 onward, this automobile plant will be able to produce 300,000 vehicles annually, with an investment of $1.1 billion. These investments will certainly play a key role in transforming India by making it a manufacturing hub in years to come. In conclusion, South Korea can be an indispensable partner of India in its Act East Policy in the Indo-Pacific region. In the context of growing Chinese assertiveness, India and South Korea share a common vision as well as similar concerns with respect to the emerging economic and security architecture and the regional order that is taking shape in the Indo-Pacific region. Siddharth Singh is a researcher pursuing his Ph.D. from JNU, New Delhi.